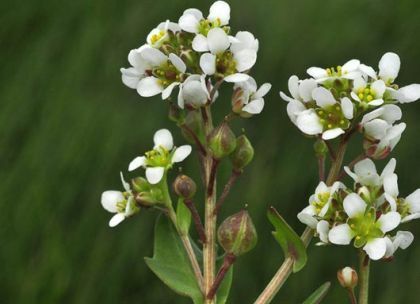 On muddy seashores, estuaries and coastal mudflats from April to July, English Scurvygrass can be found, frequently hybridising with Common Scurvygrass, making identification a little difficult. 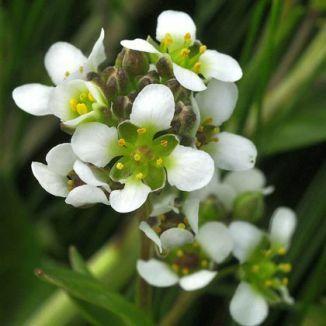 It is an erect biennial or perennial, up to about 35cm high and it has 4-petalled white flowers (10-14mm across) in crowded racemes. The basal leaves are narrow with long stalks, the upper leaves clasping the stems. The flowers are slightly larger than those of Common Scurvygrass. This is a native plant belonging to the family Brassicaceae. I first recorded this wildflower growing on the North Bull Island, Co Dublin in 2009 and I photographed it at that time. As the name might suggest, this plant is full of Vitamin C, a deficiency of which causes the condition known as 'Scurvy'. Also known as Spoonwort with reference to the shape of its lower leaves, it can be eaten in salads where its taste is reputed to be quite salty.